Mission and Outreach seeks to serve all those in need. 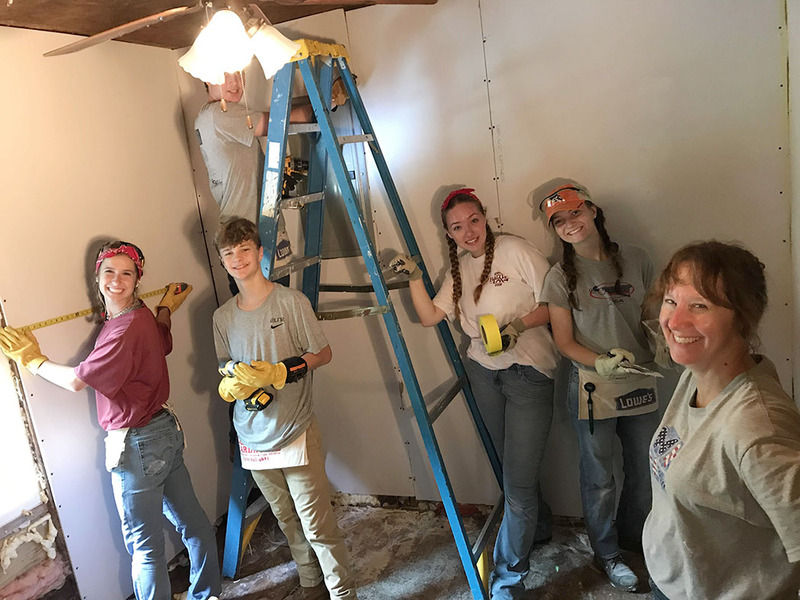 We actively support the local community: Arundel House of Hope, Habitat for Humanity, Holiday Sharing, Paul’s Place, SPAN, Winter Shelter, and the Severna Park Community Center. We also provide our facilities to Boy Scout’s of America, Narcotics Anonymous, and Alcoholics Anonymous. Appalachia Service Project (ASP): Come and be the hands, feet, hammers and circular saws of Christ alive in the world. We will work together, have fun together, worship together, and help transform the lives of those we will serve by making their home warmer, safer and drier. The dates for ASP 2019 are June 23-29. Open to youth 14-18 years old and adult mentors; no previous rehab or construction experience necessary. For details and to sign up contact Rev. Matthew Hanisian. Arundel House of Hope/Fouse Center: This organization provides emergency, transitional, and permanent housing for the homeless; employment assistance, and mental health and substance abuse support. For detail contact Mark Kellogg. Backpack Buddies: Gathers, packs and delivers weekend food to AA County students in need each Friday. Currently working with three local schools. This ministry allows these students to have healthy foods at home and be ready and able to learn. We believe it helps ease the financial burden for these families as well. 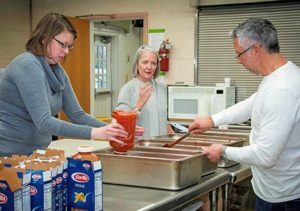 St. Martin’s members make, donate, buy, sort, and pack food each week. The fellowship is priceless. All ages can participate, contact Michele Cummings. Christmas Mart: A showcase of quality handmade arts and crafts from local artisans. Next year’s event will be held Saturday, December 1, 2018 from 9:00 am to 2:00 pm. Run by our ECW (Episcopal Church Women) the proceeds from the event support a variety of Church & community outreach projects. If you wish to be a part of our fun and exclusive list of designers and crafters please submit our Vendor Application. Holiday Sharing: This program provides food baskets and gifts at Thanksgiving and Christmas for some of the neediest families in our county. Contact Cindy Rott. Many Rivers: This group aims to address the effects of injustice and poverty in the world around us, and in so doing be the “face of Christ” in our community. We welcome you to join us as we educate ourselves to the issues, take action, and continue to develop our relationship with St. Philip’s in Annapolis. This education effort takes place during the 9:00 a.m. Adult Forums on Sunday. Click here for more details or contact Alison Cullinane. Paul’s Place: Parishioners give time and material support to programs at Paul’s Place, providing food, clothing, job and educational opportunities to residents of a southwest Baltimore neighborhood. This ministry is important as it provides for those in need and creates a bridge between communities, building understanding and brotherly love. Every member of the congregation is invited to participate regardless of age. Paul’s Place Serving Lunch: Volunteers visit Paul’s Place the first Tuesday of each month to participate in a prayer meeting and serve guests lunch. This long standing ministry enables us to see the face of God in everyone. Paul’s Place runs on volunteers and we on the work we do there. All are welcome. Cooking for Paul’s Place: During the program year, join us in the kitchen at 9:00 a.m. and help us cook up something tasty to take to Paul’s Place. No experience necessary. For details and volunteer opportunities contact Dawn Major. If you are interested in learning more about Paul’s Place please contact Kris Chappell, or check out our volunteer calendar for opportunities this month. Scouts: St. Martin’s has sponsored Boy Scout Troop 855 for 50 years. Parishioners are always welcome. For more information please email Boy Scouts or Cub Scouts. SPAN (Severna Park Assistance Network): Provides help to people in a critical or emergency situation such as utility turn-offs, court-ordered evictions, prescription/medical needs, and food. Anyone can participate through monetary donations, food donations, holding and supporting fundraisers, and volunteering at SPAN directly. Visit SPAN’s website for more information. Winter Shelter: We shelter 25-30 homeless men as part of Winter Relief. We provide hospitality, meals, laundry, and safety for one winter week: March 18-24. We are offering shelter to men who are often marginalized. We join together with over 70 congregations to each take a week as we work together to alleviate some of the suffering these men face. This is a multi-faceted ministry that involves people of all ages including children and youth. To help contact Susan Griesmyer. If you are interested in volunteering or for more information please contact us.